In the powerful conclusion to Robin LaFever's New York Times bestselling His Fair Assassins trilogy, Annith has watched her gifted sisters at the convent come and go, carrying out their dark dealings in the name of St. Mortain, patiently awaiting her own turn to serve Death. But her worst fears are realized when she discovers she is being groomed by the abbess as a Seeress, to be forever sequestered in the rock and stone womb of the convent. Feeling sorely betrayed, Annith decides to strike out on her own. "I tighten my grip on my blade, reminding myself that the abbess has assured me it is just one of Mortain's many mysteries, why He has called the others first. If I ever come face to face with Him again, I shall ask why. Sooo good! Mortal Heart was to the His Fair Assassin series what Bitterblue was to the Graceling series. If you haven't started these books yet, I highly recommend them. If you have, you definitely want to read Annith's story! 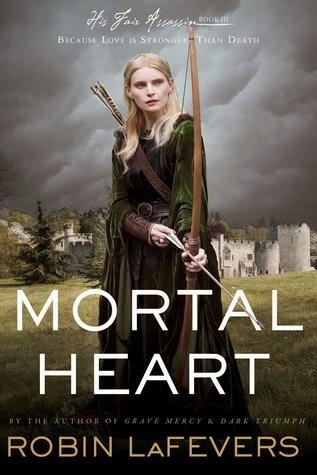 For those who don't know, MORTAL HEART is the third book in the His Fair Assassin Trilogy. This entire trilogy has been such an amazing adventure! Grave Mercy absolutely captured me, fascinated me, and drove me crazy with tension. Dark Triumph made me feel so deeply, about love, friendship and betrayal of the deepest kind. Mortal Heart broke my heart, then put it back together again, even stronger. What is so amazing about this series is how each of these girls were so totally fierce, brave and intelligent, but in completely different ways. Reading about Annith in the other books, I kind of expected her to be a little bit of a pushover. I was so wrong. After finishing this story, I think she may have been the strongest of them all. The things she endured were horrific, but she was still able to put others before herself, and rely on herself. I love her! I don't want to say too much about this because of spoilers, but the tension-filled relationship between Annith and a certain mysterious man was really well done. The bond they developed was so unlike anything I've ever read, and it was strange and exciting and kind of awesome. Robin LaFevers is one of the most talented writers in YA, and if you haven't read her books yet, I really hope you will give them a try! I love that you have book doppelgangers as part of your review. So cool. I really enjoyed this series as a whole. I'm so excited to binge read this series! I've been waiting for Mortal Heart to come out. If it's what I'm expecting, I've got some great reads coming up! I loved Kiss of Deception and have to also recommend The Queen of the Tearling if you haven't read it yet!